“Here is a summary of the four market valuation indicators we update on a monthly basis. Which brings me to price-to-book. The P/B ratio reflects the value that investors attach to a company’s equity relative to its book value of equity. The book value of equity is an accounting measure that is based on the historic cost principle, and reflects past issuances of equity, augmented by any profits or losses, and reduced by dividends and share buybacks. The chart below compares the overall price-to-book value of the S&P 500 to the index itself. Currently, investors are paying a premium of 5.64 times the book value of the index which is the second highest level on record. While valuation measures are not a great “market timing indicator” there are useful in determining forward return expectations from the index. Unfortunately, as is always the case during late stage market advances and market topping processes, measures of valuation are dismissed and/or diminished by measures to explain why “this time is different.” Unfortunately, this has never been the case, and will likely not be the case this time either. For most investors today who are planning on annualized 8% returns over the next 20-years, the biggest increase will be in the level of disappointment in what is actually received. “So what’s all this debt being used to fund? Share buybacks, of course. More is spent on share buybacks than on capital expenditures (Capex). Companies are making corn dogs from their seed corn. The record buying spree is twice that of the early months of 2014. But the problem currently is despite the rampant increase in share buybacks, earnings are no longer growing. 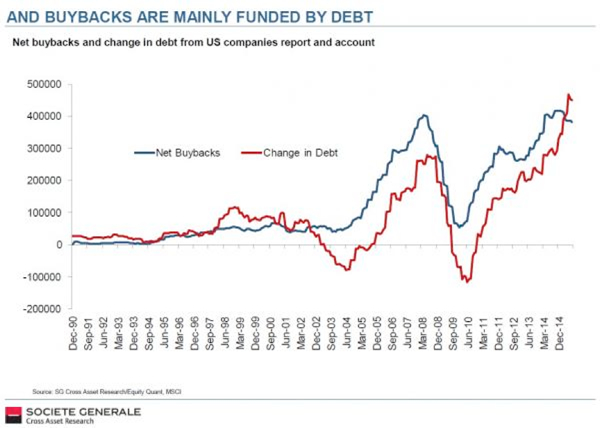 However, companies are not just borrowing to complete share buybacks but also to issue out dividends. According to the most recent S&P 500 company filings, the level of cash dividends per share have now reached $11.28 which is near the peak level of $11.35 at the end of 2015. This recovery, as expected, was driven by the quick actions of global Central Banks to run to the rescue. The chart is getting so cluttered with announcements I am running out of room to keep them all listed. For the “bulls” there is a bit of support here for a breakout above 2100 and a push back towards the old highs of 2135. With the focus of the markets putting the “Brexit” in the rear-view mirror, for now, attention is turning back towards the domestic economic backdrop. The “timing” is good. With the recent bounce in both the ISM Manufacturing & Services reports, the “bulls” will once again focus on an “improving” economy and hopes for an earnings recovery in second half of the year. Unfortunately, these hopes will be disappointed as the drag from global weakness and the end of a restocking cycle quickly conclude. However, from a short-term technical perspective, the push of 2100 is very likely particularly if the employment report on Friday shows even modest improvement. However, a failure to maintain the levels above 2100 through the end of next week, particularly given the current overbought conditions as shown below, will likely see a return to the 2040-2100 trading range we have been caught in over the last several months. Importantly, this short-term analysis does not nullify the long-term view of the risk currently residing in the financial markets. My expectation is that August and September remain high-probabilities for a retest of the February lows as concerns over the election heat up. But then again, it really is all about the Fed. Right?